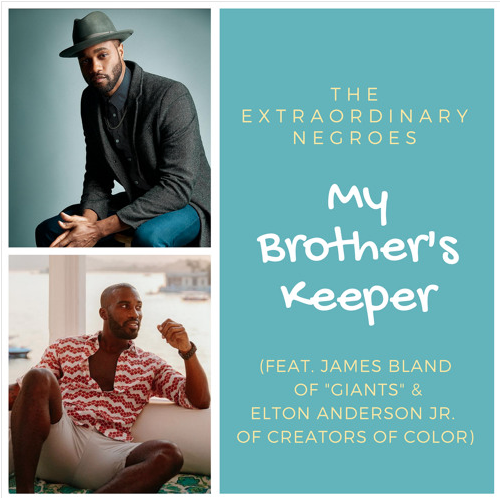 We're a day late and a dollar short, but hopefully we made up for it by bringing along James Bland of the Emmy-nominated, smash hit web series "Giants" and Creators of Color founder and celebrity photographer Elton Anderson Jr. We discuss their viral Instagram antics, how friendship is a form of self-care, how photography and film became their creative outlets, and how their brotherhood has propelled their respective careers to the next level. Additionally, Jay needs more podcaster friends, Fabulous won’t find a fan in Alex, and are Fried Lobster and Cheddar Bay biscuit Waffles for the culture? And for those interested in supporting our movement, we graciously accept Patreon (patreon.com/theextraordinarynegroes) and PayPal (paypal.me/theextranegroes) donations. Subscribe to The Extraordinary Newsletter. All the cool kids are doing it. April is Stress Awareness Month and we want to hear your best ways of dealing with stressors, any precautionary tales of how they can affect the body, what your self-care looks like, and/or anything else related to acknowledging that stress is real and necessary to manage. April is ALSO Sexual Assault Awareness Month. In light of recent events with sexual assault in the entertainment workplace being brought to the forefront and fully addressed, we want to address this issue taking place everywhere. We're accepting personal narratives, essays, poetry, prose, and any other type of writing that gets your point across about sexual assault. Because of the nature of the topic, we are willing to publish Anonymous pieces. We are accepting submissions & pitches from EVERYONE. We mention this because men and non-binary people have just as poignant voices and stories to tell about their own experiences but sometimes shy away from sharing due to toxic perceptions that hand out shame versus compassion. Our platform is a safe space for everyone so feel free to submit/pitch. Please send all pitches/submissions to submissions@theextraordinarynegroes.com. In this episode, we're joined by the divine trinity of songstress Amber Strother, vocalist Anita Bias, and keyboardist extraordinaire Paris Strother. Better known as 2017 Grammy nominees KING. We discuss the secret recipe of their lush sound, the integral role that The Purple One played in their careers, and how binging on Mario Kart keeps the creative juices flowing. Additionally, Alex has a vision of love, Jay will sleep when he's dead, and Memphis Bleek longs for the days of yore. The Afterparty: "The New Edition Story (Part 1)"
On 12/15, we attended the world premiere screening and cast Q&A of "The New Edition Story" and recorded this episode immediately afterward. So in this episode, we discuss out thoughts, opinions, and reactions to Part 1 of "The New Edition Story", our experience watching this movie with Bobby Brown, BET executives, and the rest of the cast, and what we learned about New Edition by watching this movie.